Now the weather is cooling off. I have finished my Api Guard Treatments. Some beekeepers who have put on the Api Guard late are finding the gel trays not being emptied of all the gel. This is because of the cooler weather. It was best to get this on by Sept 1st. The later treatments may not be as effective but can still do some good. With the cooler temperatures it is better if the ApiGuard is put directly on top of the cluster. If you are in a two or three deep hive, the ApiGuard and 1-1/2"shim should now be placed under the top box. This placement will be a little warmer near the cluster and the odor should be more effective. Feeding is still going on. It is important to get this done as soon as possible. Feeding spurs brood laying. If the feeding carries on into late October, brood rearing may be present in the colony into late Nov. or even into Dec. 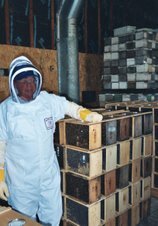 This late brood rearing makes the bees consume more of their winter food stores that they may need in late winter. The weather next week is going to be in the 70's. This maybe the last chance to get effective mite treatment for the rest of this fall. The ApiGuard should be put on by Sunday to be in place when the warm temperatures hit. ApiGuard works best in the 70's. As the weather cools into the 60's it becomes much less effective. With the harvesting of honey almost done, what do we do with the wax cappings. It is nice to make something out of them. Candles, lip balm, or a salve. The first step is to make the cappings usable. I take two stainless pots and make a double boiler with them. The first pot has water in it. I take the second pot that is smaller and float in the water of the first pan. The cappings go in the small pot and I turn on the stove. Beeswax melts at 160 degrees F. The nice part of the double boiler is the water can't get hotter than 212 degrees F.
The water gets hot and melts the wax. I usually turn off the stove when the wax has melted. I walk away until the next day. I then take out the wax block that is floating on top. Underneath the wax is old honey now burnt and slum gum. Then the crud is cleaned up and the bottom of the waxed bock is surface scraped to take off any crud. After everything is cleaned up I then remelt the wax block in the double boiler, when it is liquid I pour it through a tee shirt that is stretched over a rough mold for straining. Once it cools I can use this clean beeswax for some of my projects. Be careful when melting beeswax it can be flammable if heated to hot. If the beeswax or hot water spills it can burn a person. Never leave a stove unattended when melting beeswax. Always have a plan in place if a fire starts. Wendy and I went to a local apple festival. It is an event we have attended for 13 years. 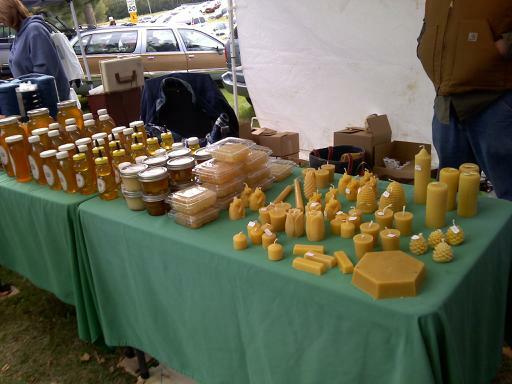 It is a good venue for us and we sell a fair amount of honey. When attending this type of festival it is a good idea to go to the place to see the layout before the event. This place is a little hilly so I bring wood to shim up the table legs. If there is another honey person there ( I ask ) I don't set up there. Having competition from another honey vendor usually hurts both beekeepers and it is not fair to horn in on someone who has already been there. We have labels, scissors, tape, pens, chairs, tables, a good quality E-Z up for shade and weather protection. Ample product for the event. We have some farmers markets after this one so there is an outlet if we over bottle. It is important to have a full table and keep it full. When a table looks empty people tend not to buy. A full table makes you look professional. Set a table up at home and see how it looks. Having labels that are all the same gives a good look of a pro. Remember this is food. If your product does not have a favorable appearance, people won't buy and your cash box will not have a favorable appearance at the end of the day. Api Guard is a Thymol gel pack. A 1-1/2" shim is needed to raise the roof so the bees have access to the gel. I am almost done pulling my honey. As the supers come off the mite treatment Api Guard goes on. Api Guard is a Thymol gel. It is packed in a foil pack. The foil lid is peeled back and the gel pack is placed on the top bars of the top box of the hive. The gel pack is on for two weeks then another one is put on, for a total treatment time of 30 days. All holes are plugged and the main entrance is open. The slide board is put in on any Varroa Screen bottom boards. It is important to put Api Guard on now, being it is temperature sensitive. If the daytime high temperatures dip into the 60's Api Guard becomes less effective. Treating in early Sept is usually the best time to do it when daytime temperatures are still in the 70's. With the humid weather we have been having I have seen rising moisture levels in honey beekeepers who have brought some honey by for me to test. A beekeeper using a bee escape to pull honey over a humid stretch of weather brought me a sample. It was over 20% moisture content. Remember honey that is higher than 18.6% moisture content will ferment and is not Grade A honey. Now with the cooler weather and some better dew points I am hopeful that the moisture levels will drop to a more manageable level.